Directions: For Adults take one (1) tablet once or twice daily, or as directed by a doctor. Chew or let tablet dissolve in mouth before swallowing. Food Sensitivity: Free of yeast, gluten, wheat, soy, dairy, sugar, salt, shellfish, animal products or derivates. This product does NOT contain animal products, derivatives or byproducts. 100% vegetarian, vegan. 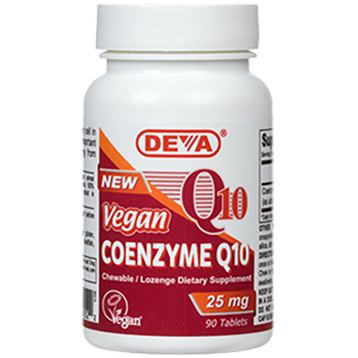 DEVA Coenzyme-Q10 is Certified Vegan by the Vegan Society. WARNING: Always consult your doctor before taking any dietary supplements. Tamper Evident: Do not use if imprinted seal under cap is broken. Keep out of reach of children.